Sacramental Moderators: Rev. George Munjanattu O. F. M. Conv., Rev. John Pozhathuparambil, O.F.M. Conv. Daily — Tue-Fri: 8:00 a.m. The Camp Taylor neighborhood in Louisville grew out of a World War I Army camp. At the request of residents known as the “Catholic Welfare Club of Camp Taylor,” a Catholic school was established as an offshoot of St. Elizabeth Parish in 1923. The school was a soldiers’ barracks remodeled by the club members and made into two classrooms. Two Sisters of Charity of Nazareth taught the seventy-seven children who were enrolled. Soon after, Mass was offered in one of the classrooms on an altar improvised from desks. Camp Taylor became a mission in 1924 and then a mission church of St. Elizabeth in 1926. A new two-story, modern school opened on May 22, 1927, with the second floor made into a temporary church. In November 1928, Father Francis J. Timoney was appointed the first resident pastor. A temporary basement church was built in 1939, which served until July 1996. 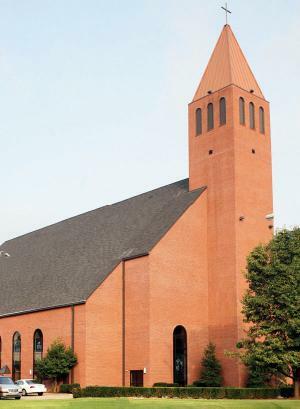 As Holy Family’s membership increased, three new churches were carved out of the parish: St. Stephen Martyr in 1948 and Resurrection and Guardian Angels in 1957. The present church was dedicated on May 28, 1997. From its founding until the last decades of the twentieth century, the parish utilized farm houses, Quonset huts, and other buildings for its various ministries. From a patchwork of Army barracks to a modern church campus, the parish has been enriched by the patchwork of over 1,600 parishioners who gather as Holy Family Parish.